A really spooky game on Halloween night in the fog and a nice 3-0 win. Best quote from Steve Lycett "For once I had an excuse for not having the Foggiest clue what was going on". A super 7-2 win with no adults playing at all! Seb writes "1s 30 game unbeaten run ends with late 1-0 loss at Old Hales. Dominated game but couldn't get the goal that would have opened it up". A high scoring 4-4 draw earns our second point of the season, keep fighting ladies! Balf's reports "Men's 2s back on form with a solid 7-2 win against Telford. 2 goals a piece for Tom Booker, Ben Cooper and Andrew Dellow". Another draw this time 2-2, good work ladies. Langers writes "It was a long way to go to Stourport... but worth it when the high press works in last 5 minutes to force a defensive error; Henry intercepted the cross field pass, drew the keeper and slipped the ball to Gabe who slotted into the open goal. Archie Gale had another fine game earning his second POTM in two weeks!" Tough day for our ladies 3s going down 9-0. 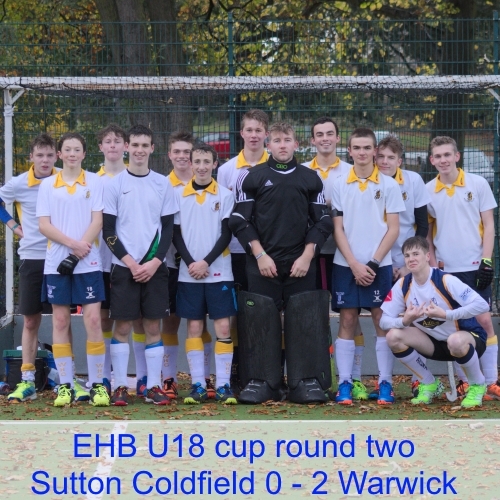 Nick writes "John Sawdon scores as Men's 4s held to a 1-1 draw at home to Sutton Coldfield". Also very tough for our ladies 4s going down 10-1. Claudio sent in this report "I'm in London but gather the 5ths are up to 3rd with a 3-2 win at Coalville. .Steve Lycett man of the match as the stand in Keeper. Goalscorers for the 5ths Josh Cooper Will Astley and capt Ian MacDonald." A tough trip to Stourport with a weakened side. I understand we lost 0-9, tough luck ladies! Langers reports from the side line "Superb match in which we had the upper hand and some quality possession. The first half ended 0-0 with Warwick having hit the underside of the bar, only to see it fly down onto the goal line and bounce back out. Second half pressure told and Alp Shaw was on hand to score both goals as Warwick ran out 0-2 winners. Some absolutely mesmerizing skills on show. I reckon 3 Sutton defenders are still heading off the side of the pitch from George's sublime feinted move. Wonder who will we get in the next round? Well played lads you gave out travelling spectators something to really enjoy in the freezing cold. "